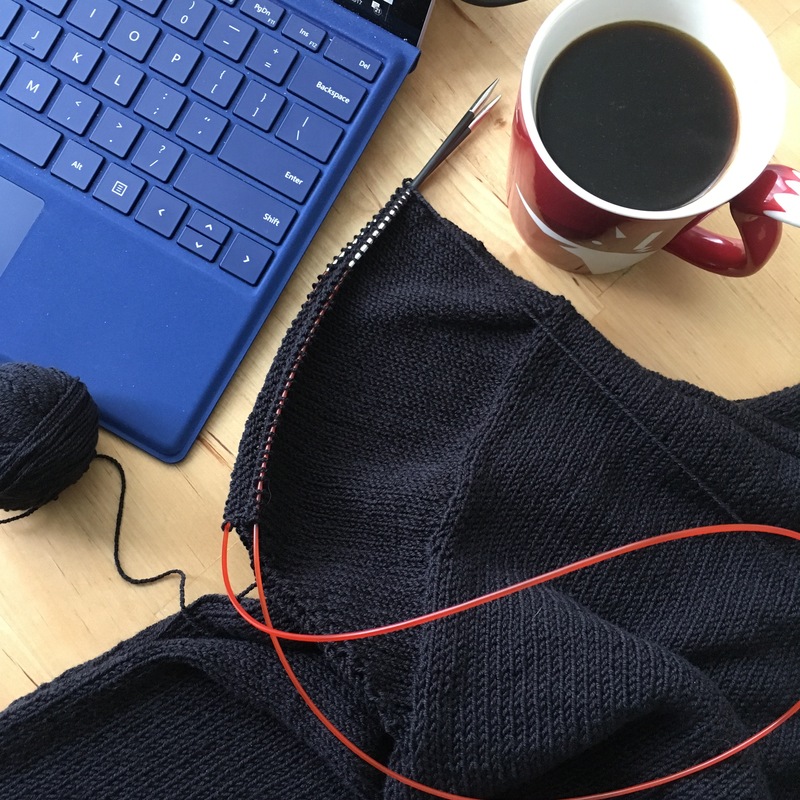 I’ve been working on a big, boxy, black sweater for some time now. It’s probably been a year, or close to it. It’s not that it’s a boring thing to knit. Well, it is boring. But that’s the way I like my knitting projects. I like them to be simple. Easy. Something I don’t have to pay much attention to while I’m doing it. I like to gaze out the windows while on a road trip… as I knit. I like to keep busy while Netflix binging. So I knit. See how this works? I don’t want to be staring at what my hands are doing, so the knitting has to be easy. Mindless. That’s just how I like it. Stockinette stitch. In the round. Miles of it. I think the trouble with this particular project is that the yarn is black, a fairly fine gauge, and the stuff is kind of slippery – so I’ve had stitches squirt off the needles a couple of times. I knit mostly in the evening (when not on the road or camping), and the light in our apartment is low. So it’s hard to see. I have no problem knitting without looking at it, but sometimes you have to see what’s going on and where you’re at. So, when I run into something with this sweater that needs to be looked at in the daylight (like dropped stitches), I lay it aside and pick up another project. That’s why it’s taking longer than usual to complete. But I’m happy to report that I’m finally in the homestretch. The body is done, finished with a three-needle bind off at the shoulders, and I’ve started the sleeves. I tried it on when the shoulders were done and it’s a perfect fit! Yay! I’m going to love wearing this one. Since I was in my mid-teens, the big, boxy, black sweater has been a staple in my wardrobe. It’s a part of my uniform, whether the fashion mags say it’s in style or not. It’s just so me. And I can’t wait to wear one that I’ve designed and made myself. The other work in progress that’s had a bit of action this past week is the RV search. My husband and I have been talking a lot about the options out there that would be right for us. Thanks to some wonderful readers who shared helpful and informative links, I’ve done SO MUCH reading this past week. And the links led me to other links and more great articles. I’ve started to follow blogs and have joined Facebook groups for RVers. Really great stuff! There are a lot of people out there who are living the full-time RV life and they are so willing to share their knowledge and experiences. We have talked about converting school buses, and all the pros and cons involved in a project like that. As much as the idea of that thrills my soul (ah! My kingdom for a skoolie! ), I feel like it probably isn’t the right time for us to take on that challenge. I think our first one has to be easier: something just a few years old that’s structurally solid, mechanically sound, and just in need of a little bit of redecorating (’cause that’s the fun part!). We’ve talked about, read about, and looked at, travel trailers, Class C motorhomes and Class As, even camper vans. This little cutie would be a breeze for Cheri (our Jeep Cherokee) to tow, and it has a great layout, with the kitchen on one end and ‘bedroom’ on the other. But it’s a bit on the small side (even for us tiny home dwellers) to live in full time. So cute, though! After getting quite a lot of feedback from a number of experienced RVers, we feel that a Class A motorhome would likely be our best fit. We’ve been told that it’s the easiest to drive (even when towing your vehicle). That’s an important factor for both of us. So, last week, we went to a couple of local RV dealerships to check out some used Class A motorhomes. And we actually found one that, if the time was right and all our other ducks were lined up, we would have bought on the spot. We did decide that the dealer who was selling this RV was the guy we want to buy from when we’re ready (which, if it all goes according to plans, will be around the end of this summer). So, that’s a step in the right direction. When we’re ready, if the RV we saw this week is sold (which is likely), we can tell the dealer we want one just like it, and he will probably be able to find us one that’s going to work for us. In the meantime, before making our final decision, we plan on renting a few different RVs over the course of the summer months ahead, just to get a feel for what it’s like driving (or towing) one, and living in one. How about all of you? Got anything in the works? I’d love to hear about it!